In Norse mythology, the Nine Mothers of Heimdallr are nine sisters who gave birth to the god Heimdallr. The Nine Mothers of Heimdallr are attested in the Prose Edda, written in the 13th century by Snorri Sturluson; in the poetry of skalds; and possibly also in a poem in the Poetic Edda, a book of poetry compiled in the 13th century from earlier traditional material. Scholars have debated what being "born of nine mothers" implies and have sought to connect the notion to other European folk motifs. 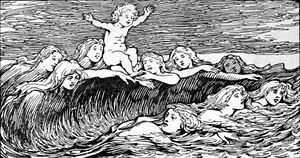 Scholars have theorized that Heimdallr's Nine Mothers may be identical to the Nine Daughters of Ægir and Rán, who personify waves. In turn, Heimdallr would be born of the sea. "Offspring of nine mothers am I, of nine sisters am I the son." In chapter 16 of Skáldskaparmál a work by the 10th century skald Úlfr Uggason is quoted. The poem refers to Heimdallr as the "son of eight mothers plus one". Prose following the poem points out that the poem refers to Heimdallr as the son of nine mothers. Imd and Atla, and Jârnsaxa. with the ice-cold sea, and with Sôn's blood. Once bore the man so might in arms. Imth and Atla, and Jarnsaxa. With the ice-cold sea, and the blood of swine. endowed with power from the gods. a spear-splendid man, along the Earth's edge. with the cold sea, with boar's blood. Angeyja Meaning obscure. Proposed etymologies yield 'the harasser', 'bark', and 'those of the narrow island'. Eistla Meaning obscure. Suggestions include 'the stormy one' (from eisa, meaning 'hurry'), to a potential a sea god (from eista 'testicles', in other words, 'the swollen, swelling ones'), and 'the glowing one' (from eisa 'glowing ash, fire'). Gjálp Possibly 'seeress' or 'roaring one' The name Gjálp appears frequently for jötnar in the Old Norse corpus. Gjálp and Greip appear together as names of the daughters of the jötunn Geirröðr in Skáldskaparmál . Gjálp attempted to kill Thor by causing a river to swell. Greip 'Grasp' Gjálp and Greip appear together as names of the daughters of the jötunn Geirröðr in Skáldskaparmál. Imðr or Imð Possibly related to íma 'wolf'. Ulfrún 'Wolf rune' or 'wolf-woman' Occurs as an Old Norse female personal name. The names of all nine mothers mentioned above in Völuspá hin skamma appear elsewhere as the names of female jötnar (generally in the þulur). Adding to the confusion, Orchard points out, Gjálp and Greip are otherwise mentioned as jötunn maidens who seek to contravene the god Thor from reaching their father, and Járnsaxa is otherwise the mother of Thor's son, Magni. Heimdallr Lifted by the Nine Wave Maidens (1882) by Karl Ehrenberg depicts Heimdallr's mothers as "wave maidens"
Some scholars have linked the Nine Mothers of Heimdallr with the Nine Daughters of Ægir and Rán (who personify waves), an identification that would mean that Heimdallr was thus born from the waves of the sea. However, this connection has been questioned on the grounds that the names presented for the Nine Daughters of Ægir and Rán and the Nine Mothers of Heimdallr (as found in Völuspá hin skamma) do not match. Scholar John Lindow comments that the identification of Heimdallr's mothers as Ægir and Rán's daughters do, however, match on the grounds that Ægir and Rán's daughters, like Heimdallr's mothers, are sisters, and that two separate traditions about Heimdallr's mothers may explain the differences between the two. ^ a b Simek (2007:21). ^ Simek (2007:111), Faulkes (1995:82). ^ a b Simek (2007:178). ^ a b Simek (2007:339). Bellows, Henry Adams (1923). The Poetic Edda. The American-Scandinavian Foundation. Thorpe, Benjamin (Trans.) (1866) The Elder Edda of Saemund Sigfusson. Norrœna Society. This page was last edited on 24 December 2018, at 22:41 (UTC).